. : Optics & Photonics Focus :: The Random Walk towards Quantum Computing :. Subtle quantum effects will be at the heart of the quantum computers of the future. Very few existing setups, however, offer the necessary stability and control to exploit such effects at the moment. As it turns out, arrays of waveguides meet this challenge, and they, therefore, serve as test beds for studying quantum computing. Implementing a continuous quantum walk. Optical micrograph of the 21 coupled waveguides (center) with three input waveguides (bottom) and 21 output waveguides where the quantum walk occurs. Picture: O’Brien group/arXiv. Take a picture of a landscape with your cellphone. Now take a picture of the same landscape using a professional camera. Put the two pictures side by side and you will notice quite a lot of difference in the detail, even though the landscape remains the very same. Similarly, there is a significant difference in the level of detail involved, depending on whether it is classical physics, or quantum physics, which describes Nature. Intrinsically quantum phenomena, such as the superposition of quantum states, cannot be captured accurately by classical physics. When developing future quantum technologies, researchers need to make sure they use their setups in a way that allows them to resolve the relevant quantum effects. An international research collaboration led by Jeremy O’Brien at the Centre for Quantum Photonics, Bristol, UK, has shown that a set of coupled waveguides realizes such a setup and can, therefore, be used as a test bed for studying quantum computation devices. The classical random walk models stochastic processes. 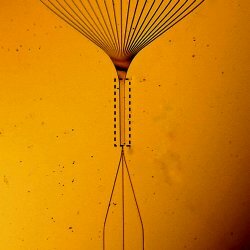 A famous example of such a process is a ball moving through a Galton board — a vertical board that consists of interleaved rows of evenly spaced obstacles. At each obstacle, the ball randomly passes either on the left or on the right of the Galton board. Whether the ball passes on the left or on the right is independent of where the ball is coming from. 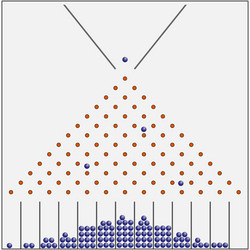 At the end of the board, the balls spread out and assume a Gaussian distribution. Further examples of random walks would include the zigzag path described by somebody who has had one drink too many trying to walk in a straight line, or, on a more serious note, Brownian particles in water that jitter as a result of the thermal motion of the water molecules. In fact, a staggering number of processes, ranging from the diffusion of colloidal particles, to the evolution of the population of wild animals, to the fluctuations of stock prices, is described using random walks, turning this model into a standard starting point for the description of many complex processes. In a quantum world, a particle moving through a Galton board can pass an obstacle, using a simplified picture, on its left and on its right at the same time, producing a so-called quantum superposition. At the end of the Galton board, the particle will thus be in a superposition of a large number of positions. Ultimately, the superposition leads to a probability distribution, describing the chance of measuring the particle at a certain position. It is important to understand that this latter process appears to be objectively random. In contrast, its classical counterpart is only effectively random because the path of the ball crucially depends on how the ball enters the Galton board, a process that is beyond experimental control. The classical random walk as illustrated by the Galton board. A blue particle at the top moves through an array of interweaved red obstacles. Each time the particle encounters an obstacle, it can pass either on the left or on the right of such obstacle. The position at which the particles exit at the bottom of the board shows a Gaussian probability. Picture: Wikipedia. Thus, while both the classical random walk and the quantum walk appear to be very similar, the difference lies in that the long-term behavior of the former will, typically, not depend on its initial condition, whereas a quantum walk will always remember the particle’s initial state. A well-controlled quantum system with low noise will undergo a reversible evolution, leading to distinctly non-classical long-term behavior, depending on the initial state of the quantum walk. However, as long as the experiment is done with only one particle, it is not possible to distinguish conclusively between the classical walk and the quantum walk. "The interesting aspect of our experiment," Jeremy O’Brien explains, "is that we were able to implement a quantum walk of not one but two photons. In this way, we were able to observe interference effects demonstrating that these photons do, in fact, behave as quantum particles, and not as classical particles." While, at least in principle, classical particles are always distinguishable, quantum particles can be objectively indistinguishable. By sending two photons in the waveguides separately, one first, followed by the other, O'Brien's team made them distinguishable from one another. When both photons were sent at the same time, however, the photons were indistinguishable. The measured positions of both photons were studied and showed clear differences depending on whether the photons were distinguishable or indistinguishable. Physically, the quantum walk was implemented using an array of 21 silicon oxynitride (SiOxNy) waveguides that were brought so close together that photons could continuously tunnel between adjacent waveguides. This study of quantum walks presents direct analogies to the study of quantum computers. In fact, O’Brien’s experiment crucially depends on the quantum superposition of particles. The same is expected to be true for quantum computers of the future. Therefore, as O’Brien points out, their setup serves as a good framework for studying quantum computing. "O’Brien’s research shows that we have already come a long way towards the realization of quantum computers," says Alexander Gaeta from Cornell University; New York, USA [1, 2]. "Now, we can be sure that these systems do indeed exhibit quantum behavior that can be considered for further studies into quantum computing." O’Brien, too, is rather optimistic when it comes to the future of quantum computation: "there are still a lot of challenges lying ahead, such as the photon counting rate, which we have to improve. Nonetheless, the principles we relied on are now showing to be solid enough to study the effects of more photons and consider implementing first algorithms." J. E. Sharping, K. F. Lee, M. A. Foster, A. C. Turner, B. S. Schmidt, M. Lipson, A. L. Gaeta & P. Kumar, Generation of correlated photons in nanoscale silicon waveguides, Opt. Express 14, 12388-12393 (2006). M. A. Foster, R. Salem, D. F. Geraghty, A. C. Turner-Foster. M. Lipson & A. L. Gaeta, Silicon-chip-based ultrafast optical oscilloscope, Nature 456, 81-84 (2008). Alberto Peruzzo, Mirko Lobino, Jonathan C. F. Matthews, Nobuyuki Matsuda, Alberto Politi, Konstantinos Poulios, Xiao-Qi Zhou, Yoav Lahini, Nur Ismail, Kerstin Wörhoff, Yaron Bromberg, Yaron Silberberg, Mark G. Thompson & Jeremy L. OBrien, Quantum Walks of Correlated Photons, Science (2010) 329, 1500-1503 (link).